In part two of the Vegas installment, we begin at the pool. Believe it or not, days before the brink of October, it was a scorcher in the city. I felt ridiculous wearing jeans, so it was great that we were able to hit the pools. C loved the lazy river (see above) and her dragon/turtle innertube that she continued to wear even in the hotel room. After some swimming and teeth-chattering (C gets cold very easily), Ian and C hit t he strip while I hit the hotel spa. Now, I don't get massages very often (she says after having blogged about exactly that two weeks ago), so this was a treat. Honestly, before the Chinese massage, I think the last one I had was just before I got married three years ago. At the end of that fantastic, yet all too fleeting, escape, the masseuse said something along the lines of it being nice that my husband was letting me have a little break. "Are you kidding?" I said. "He actually sent me here." After we rested a bit at the hotel, we packed up our stroller gear once again to investigate some casinos. We hit the Palazzo, which literally had scented air conditioning. I'd never experienced that before, but walking into that building was like walking into an atomized flower petal. There's also an amazing two-story waterfall (see photo, left) in the shopping walkway between it and the Venetian. Next to the fountain is a little espresso bar called Espressamente Illy. Talk about indulging. I had a little espresso, and we all shared a chocolate and strawberry crepe. As Ian said, it was going to be a five-pound weekend. Somewhere between the Palazzo and the Venetian, we were greeted by a group of Japanese tourists, one of whom, a man in his 40s or 50s was fascinated by C. (In a G-rated, cute way.) He asked to have his picture taken with her, which I found so charming and bizarre at the same time. Had we been quicker on our feet, Ian or I would've taken a picture of them taking a picture of her. Oh well. I'm imagining C on some blog in Japan right now. Tokyo Story, maybe? That night we went to Todai, in Planet Hollywood, for dinner. It's an all-you-can-eat sushi bar, and man did we test the limits of that. Maybe it would be a 10-pound weekend. Sunday was our last day in Sin City, and before we drove back to L.A., we spent some time in Caesars Palace. Mostly in the Forum Shops. There were tons of fountains, he re I'm guessing is King Triton behind C and me (right). There was also a small but stocked aquarium right outside a Bath and Body Works. Of course, down the hall from slot machines and craps tables. That's exactly the kind of juxtaposition I find fascinating about Vegas. You'll find the PG-rated attractions (M&Ms store, say) next to the not-so-PG-rated ones -- the bars that offer 1/2 yard drinks and beer kegs that could double as 3-foot-tall pneumatic tubes. All in the name of fun. And fun for the whole family at that. As we were taking the exit onto I-15 South, with the mirage of Vegas still visible in the rearview mirror, Ian looked at me and said, "This was a good, no-TV weekend for C."
"Yeah," I said, "thank goodness she only saw drinking, smoking and gambling." With gas prices higher than they were a year ago, banks failing left and right, and the economy in a general tailspin, where did we decide to go for the weekend? You guessed it: Las Vegas! Ian and I loaded up the car, packed C into her car seat, making sure she had access to food and games and made a run for the Nevada state line in hopes that we could have a little break from the day-to-day. We stayed at the Monte Carlo (pictured right, in the dark), which is located on the south end of the strip, right next to New York, New York. It was really great. Our room was nice, and they had four different pools for splashing action, including a lazy river that C went crazy for. But more on that later. First, the drive. Los Angeles to Las Vegas is about 260 miles or five hours door-to-door ... if there's minimal traffic. We left late Friday morning, which gave us nice odds, as well as on a random weekend in September during a nationwide financial meltdown. We were betting against traffic, and it paid off. She decided to wear her sunglasses and hat while drawing on her doodle pad, w hich kind of made her look like someone's crazy grandmother but also fits in with that Vegas joie de vivre. So I let it slide. We stopped at our usual McDonald's near the turnoff to Palmdale, Calif., and Ian pointed out a sign you don't usually see in the desert. (See photo on right.) The landscape surrounding that sign is like that for miiiiiiiiiiiiiiiiiiiiiiles. When does that get icy? Seriously. We also passe d by a spooky ghost town of a former waterpark. This was about an hour and a half outside of Vegas. Again, it was in the middle of the desert, surrounded by nothing other than the occasional tumbleweed. The billboard announcing "Rock-a-Hoola" waterpark was faded from the glaring sun, and the tattered "rides" themselves were sitting on nothing but parched brown dirt. The kicker was that you had to know a few miles before the turnoff that this place even existed or you'd miss it altogether. Maybe that was their biggest flaw. But, as you can see, it looks like something right out of "Lost" and the Dharma Initiative. Once we arrived in Las Vegas proper, C completely lit up. So did we. She loved the lig hts, the people streaming up and down the strip and the overall visual stimulation from that eclectically built metropolis. Our hotel was across the street from the giant M&Ms store and the Coca-Cola museum. We all looked like eager puppies hanging our heads out the window with our mouths open. And, yes, all of us had been here before. After driving up and down the strip, we settled in at the Paris for dinner. We stopped at the kid-friendly and reasonably priced Le Provencal. C flirted with the waitstaff and kept waving to our waitress as she crisscrossed the room. The restaurant was down-to-earth, the food was good, and after a couple of margaritas each (excluding C, obviously), we were done for the night. Luckily, the Paris is close to the Monte Carlo. So we loaded up the stroller and walked back to our room -- sated, happy and ready for Saturday. 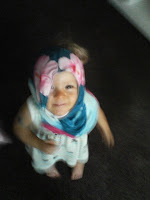 I had to post this photo of C because it reminded me so much of Edith "Little Edie" Bouvier Beale of "Grey Gardens" fame. Now that was a documentary! If you don't know the story, the doc chronicles the reclusive lives of mother-daughter duo "Big Edie" and "Little Edie" Beale, aunt and first cousin of Jacqueline Kennedy Onassis, who holed up in their rundown Hamptons home for years. It's a sad, tragic story but strangely transfixing and a cult classic, as well. Unfortunately, I didn't get to see the Broadway or Off Broadway incarnation, but I hear they were great. Supposedly, there's a movie in the works starring Jessica Lange and Drew Barrymore as the troubled women. After catching up with the blog, my friend Brian from work sent me a couple links to dilemmas in modern parenting. He seemed to think that I could somehow relate to parental paranoia. "Moi?" I thought to myself. Does he really have the right person here? I mean a little goat plague prevention, copious amounts of hand sanitizer and emergency room talk a couple days running, and suddenly you're Richard Nixon. Geez. Nevertheless, I was interested. One of the links he sent me was to an op-ed piece in the New York Sun by Lenore Skenazy titled "Why I Let My 9-Year-Old Ride the Subway Alone." It's an interesting dilemma and one that luckily I won't have to address for a few years. Yes, I'm a procrastinator, too. Paranoid procrastinator. Anyway, subways. Skenazy's 9-year-old son had asked her to leave him someplace in Manhattan so he could navigate his way home, which was across town. On the subway and/or bus. Alone. So Skenazy finally said yes, gave him a subway map, MetroCard, a $20 bill, some quarters and wished him luck. So, the question is: What would you do? Here in L.A., the subway only takes you about two blocks from where you started and then calls it a day. (See map below, courtesy of the L.A. Transit Authority.) It's not like New York City, where the trains are the equivalent of the highly congested freeways out here. 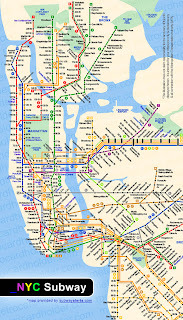 Notice the above map (courtesy of metrocardholder.com). Its multicolored veins pump millions of New Yorkers in and out of its stations every hour. Every minute. Los Angeles, not so much. 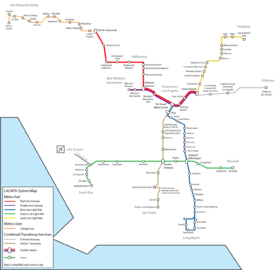 To give you an idea of the difference, in a city of roughly 3.8 million people, there are just over 300,000 daily weekday boardings on the Metro Rail (according to the Los Angel es County Metropolitan Transit Authority). For the Big Apple subway, the daily ridership is 5 million (according to the New York Transit Authority) in a city of about 8 million. Which brings us back to Skenazy's son, or truthfully, it brings me back to C. She's only 1 1/2 now -- and likely will not contend with a cobweb of trains on a daily basis -- but soon enough she'll be asking me to let her do something like that by herself. And what will my answer be? When I was about 8 or 9, I used to deliberately miss the bus from school to daycare. I hated it. I wanted to be at home instead of playing silly games with people I wasn't that crazy about ... a malcontent at 8, I know. So I'd walk about a mile or so and think nothing of it. Looking back, even though it was Oklahoma, I'm terrified at my former self. She had no idea. But I lived to tell the tale and lived to take subways in Manhattan and trains throughout Germany without a second thought. That's just the kind of kid I was. Ian, who grew up in Manhattan, didn't take the bus by himself until he was about 10 or 11. Nothing bad happened to him, save for getting a little lost, but he had the wherewithal and the quarters to find his way home. Sure, that was just an annoyance, but taking subways and buses eventually just became a way of life. Even in New York. Even as a minor. While I've come to the conclusion (within the safety bubble of having a few years before I really have to confront this) that it depends on the kind of kid C will be at 9, Ian thinks that it's just too young. And I understand that. Maybe she will be. We'll see. I want her to discover her independence, but luckily for now and in the near future, this is the only bus she'll be riding by herself. Who knew a friendly game of softball could be so exhausting? Of course there's running and catching and even a bit of sliding, but how about we leave all of that to the players on the field? No, I'm talking about just watching. And with my Energizer Bunny of a daughter, just being a spectator includes all of the above. C had a great time. She couldn't sit still. She ran around the bleachers, tried to make her great escape beyond the fenced-in park confines (her own version of swinging for the fences, I guess). She even attempted to get into the game herself, racing toward the outfield with the energy and determination I'm sure Joe Torre would appreciate. But, in the end, there was much baby-wrangling and an eerie sense that my child is physically invincible. Besides my friends/co-workers on the field, including Dave (pictured at top with Ian and C; baby-wrangling, exhibit A), Bill, Justin and Byron, we met up with some other friends from work off the field -- Brian, Krystal and her son, D (pictured above with C and me). Baby-wrangling, exhibit B. C and D had a great time. They even made hugging an extreme sport by getting so excited that one or both of them would topple over -- onto the dirty concrete, of course. These are the times when I wish C wore a helmet. All the time. And bubble wrap, for that matter. Even with adult supervision, there was noggin-thumping and wipeouts. It's always cute until there are tears, but luckily, there wasn't much of that. After the game ended, sadly not to our advantage, we headed to our next stop, a birthday party for C's 2-year-old twin friends. C continued to have a great time. But mysteriously she became the most well-behaved darling of a child as she played, drew, ate and generally had fun with her equally pint-sized friends. Maybe she felt more in her element. Maybe she had worn herself out at the game. Maybe she decided to give her parents a small but much-needed break. Or maybe it had something to do with her adorable twin birthday pals lighting up when she arrived, even offering their best Neil Diamond impersonations with their version of "Sweet Caroline." I'll have to repost the previous entry, because the video won't upload at the moment. (Now I want to hulk out.) In the meantime, enjoy this photo of C from when she was a mere 6 days old. Now that's a blast from the past! We like to call this "Womb-ie." I thought it might be fun to "retro post" every now and then. Just because I began this blog when C was 1 1/2 doesn't mean we can't revisit her younger days as an even wee-er lass. I'm starting with the best. As of today, this is my favorite C video of all time (Saucepan-head is a close second). It was taken on Weds., April 18, 2007, when she was about 4 1/2 months old. She had just learned to blow raspberries and was showing off her new talent constantly. Notice how much she's changed. Back then (yes, it was only a year ago plus change, but when this little person starts crawling, walking, talking and pony-riding in that mere year, time as you know it begins to warp), so back then, C had dark blue eyes and a brown fluff of hair. As an added bonus, I thought I'd include a sampling of what was going on in the entertainment world at that time. Enjoy! Daughtry's "It's Not Over" was No. 1 on American Top 40. You give anything a funny name, and it's bound to grow on you. You'll probably even start to look forward to it. What once terrified you can now make you laugh. And isn't that the greatest triumph of all? A few months ago, C found a particularly effective way to tease her mom. She would grit her teeth, squint her eyes and ball her fists as she shook herself in some weird sort of baby frenzy. The first time she did it, I almost called the doctor. I had no idea what to make of it. Was she having a seizure? A stroke? Method acting? Whatever it was, I wanted her to stop. And I'd say so as I unballed her little baby hands with my fingers. "C'mon, C," I'd say. "You're freaking Mommy out. Please stop." And what would she do? Just laugh. Then, after seeing the effect it had on me, she'd do it again. After calls to my mom and talking with my cousin Christy, who's a doctor, they assured me that C was normal and healthy. That subdued me for the most part, but in my mind I was always one fake seizure away from dialing her pediatrician. She never did this for Ian, and for a while he didn't believe me. (I'm not sure why he thought I'd make something like that up. What mother gets a kick out of telling her husband that their baby is convulsing on a semi-regular basis?) But then one day in the car, when she thought he wasn't looking, she did it. In her car seat, looking at me through the window. "Oh my gosh," Ian said. "She's hulking out!" And it was as if a light had gone off in my head -- a green, oversized, unpredictable light. She was having fun, and why wasn't I? Instead of diving head-first into parenting books and websites, instead of planning exactly how I was going to explain this to a team of highly trained physicians, instead of worrying myself into my own convulsive frenzy, I should have been taking pictures. Heck, video. So, finally, after months of being stunned into some sort of parental paralysis when C felt the need to "Hulk Out," this time I grabbed the camera and documented it for history. After C's close encounter of the goat kind, I felt it only natural for her next step to be a pony ride. Actually, I felt like I owed it to her after her last animal experience involved her mother whisking her away in a plague-inspired panic. Until recently, I never knew pony rides existed in L.A., much less in Griffith Park (home to Griffith Observatory, one of its claims to fame, of course, being the part it played in James Dean film "Rebel Without a Cause.") But for $3 per ride, your child can saddle up and pretend she's riding the range. Ian and I took turns walking around and around with C and Sleepy. As you can see in the above video, she was a fan. A big one. Goats and ponies in the same week? That must be like baby crack. But it left Ian with one question: Were we there only because of the blog? In other words, would we have gone there had I not had a specific reason to record it? It's a fair and inevitable question, I guess, but we both came to the conclusion that we probably would've taken her there at some point, anyway (she is, after all, still on the young side for getting her horse groove on). But even if it had been the sole reason, it's inspiring us to find new things to share with our child. And that can only be good, we decided. So is the tail wagging the, er, blog? If it has us riding a new, wider range, we say, wag away. A week ago today, pre-blog, my husband, Ian, C and I went on a little adventure with some friends/co-workers. My friend Shali suggested we go to San Gabriel (about 15 miles east of Los Angeles) and get foot massages followed by dumplings, then go shopping for our latest food fixation, Pocky! This sounds like a fun Saturday, anyway, but there are special elements to each one of these offerings that made her suggestion pure genius when you put it all together. First, the foot massage. Now, this isn't just any foot massage, and only part of it involves your foot. I know what you're thinking, and, yes, it's both legal and PG-rated. Our crew of Shali, Ian, C, Brian, Justin and Lameese met at Chinese Ancient Foot Massage (they don't have a website, so the link is to the location and some reviews). For a mere $15, they offer a 60 minute massage. You sit (fully clothed) in a large, black, comfy chair while they soak your feet and massage your upper body. This goes on for about half an hour, and then they move on to your feet. The final 10 minutes are on an actual massage table, where you get the full-body treatment (still clothed). This was all for $15 plus a $5 tip, which I find pretty reasonable. Granted, this isn't Burke Williams day spa -- it's in a strip mall called Sunny Plaza -- but it's also about $100 cheaper. I've seen some places offering 60 minutes for $45, but still. The people were great, too. Ian and I took turns with our massages while the other one was watching C. She ran around the place, which terrified me because it was supposed to be relatively tranquil. But they were so accommodating and even gave her an apple to munch on, which she happily devoured. Next, dumplings. We visited the nearby Din Tai Fung dumpling house for lunch. Justin was our resident dumpling expert. He and Lameese had been to China and gone to Din Tai Fung in Hong Kong. For the six of us, plus C, we ordered 50 dumplings! 50! Pork soup dumplings, pork and shrimp dumplings and veggie dumplings, plus some broccoli and spinach for good measure. It was unbelievable. So good. Even C enjoyed a couple veggie dumplings. (The pork dumplings were too hot for me to risk letting her try.) We were stuffed. And, again, the bill was reasonable, coming out to about $10 each, plus tip. Photos courtesy of Din Tai Fung. Already relaxed from our massages and now stuffed full of soup dumplings, we could barely make it out of the restaurant to our cars. We also had to take a rain check on our visit to the Chinese grocery store for the (Japanese-made) Pocky. A disappointment because I had been eager to track down the hilarious Pocky for Men. 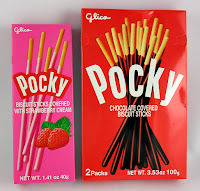 (Before I forget, Pockys are little cookie sticks dipped in different flavors, mostly chocolate.) 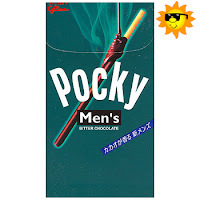 Pocky for Men is a bit of a mystery, because none of us is really sure what makes it "for men." Is it because of the bitter chocolate coating as opposed to the more demure strawberry or palatable milk chocolate? I don't have the answer, but it's delicious. And, truthfully, I like feeling a little contrarian eating something tasty that wasn't necessarily meant for me. I eat your Pocky for Men! My daughter eats your Pocky for Men! (Well, technically, she didn't, but why let reality get in the way of a fun metaphor?) I drink your milkshake, Pocky! What disappoints me is that I don't have photos of the actual outing. I diligently packed the camera, stuffed it into C's diaper bag, knowing this would be the perfect opportunity for picture-taking. But it was one of those times when you're having so much fun being so in the moment of every moment, that you neglect to record it. That's why I'm doing it here. In words. C got to experience -- right here in her city -- food and culture that might seem so far-flung to others. She looked so at home among the native Chinese massage therapists, and that made me proud. There wasn't a language barrier, there wasn't a cultural barrier, there wasn't even an etiquette barrier (which, let me tell you, we tested). They were just happy to see a happy, energetic child, and she was happy just being adored. Aren't we all? So I know what you're thinking ... how can this post possibly top goat pestilence? Believe me, I was worried about that, too. They're baby shoes, and they're Heelarious. Well, that's what they call themselves, anyway. I like to think of them as "No way in Heel." They're high heels for babies, and I'm mildly terrified. Make that just terrified. I've posted a photo, the Kayla, and I picked this one because it has zebra stripes. There's also leopard print, if your baby is more the hunter than the hunted. 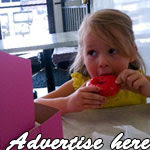 Oh, and solid hot pink, if your baby's more the reserved type. But high heels for babies, and I do mean babies (the sizes are 0-6 months), seems so wrong. There's that pesky heel, after all. It apparently squishes for "safety," and it's true that babies that young aren't usually walking as to be impeded by even a squishy heel. But as a mother of a girl, particularly one who's going to mature among the beauty-obsessed environs of Los Angeles, I get a little concerned that we might be starting too early to push our girls to be more and more like women. And speaking as someone who didn't feel like a woman until, like, last week when I asked C who her mother was and she pointed to me, I say give 'em time. They'll be telling you that your open-toe wedges are so 2008 soon enough. You can take the girl out of Oklahoma ... but apparently it follows you no matter where you go. So I thought this would be a great place to bring C. It's a weird L.A. story that we can laugh about years from now. (Remember when Mommy took you to see the goats next to the Pershing Square subway stop and the Bank of America building?) It's closer than the zoo. And, what really sold me, was that she could get a glimpse of her mother's roots -- full disclosure: I grew up in the city -- on a Wedne sday without having to leave her own (goat-tended) backyard. And she loved it. She loved the goats, and the goats loved her. C kept pointing and asking "What's that? What's that?" And one of the herd even came down to greet her. Of course I yanked her away immediately. Like I said, it's not the zoo, and who really can vouch for these goats? But this was not before she walked up to the fence separating the concrete jungle from the grassy one and touched it. At that moment, I experienced one of those parental horror moments, and two words, complete with exclamation point, flashed in my head: Goat pestilence! What had I done to my baby? Why had I brought her here to be exposed to some sort of goat plague that I could've avoided by staying home and doing the right parental thing like reading her a book or even -- gasp -- letting her watch "Mickey Mouse Clubhouse"? I immediately pulled out a baby wipe from the diaper bag and rubbed her hands over and over. Of course, right then a transient popped out of the subway and started maahh-ing at the goats. Good God, what had I been thinking? This was downtown L.A., after all. I rushed her to the car and pulled out my peach-scented anti-bacterial hand sanitizer and doused her some more. High-tailing back home, I was terrified. My little outing, my moment of parental bonding with my child was looking more and more like negligence that would certainly lead to a visit to the emergency room. Once we got inside, I washed her hands again, called my mom to get the lowdown on goat pestilence and watched as my little C ran to her toy box and pulled out all of her stuffed animals while laughing and burbling. She hadn't actually touched one of the goats. Just the fence. No cries of pain. No weird bumps. No foaming at the mouth. Maybe she would be OK after all. I come to the table a little unprepared. 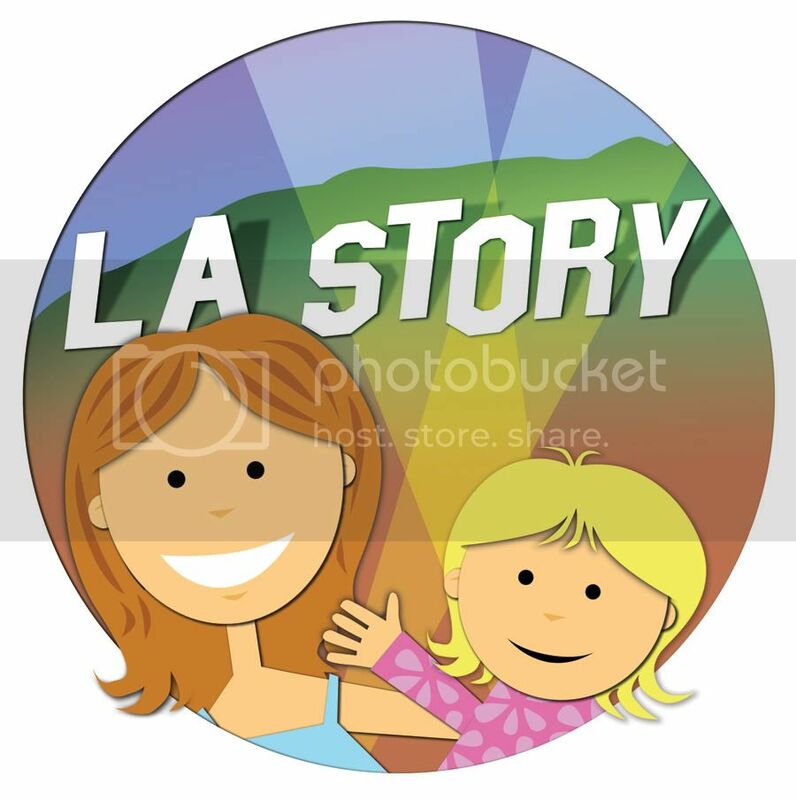 I've never blogged before but decided I wanted to document life in Los Angeles for my 1 1/2 year-old daughter, C. I'm not a native, I was born in Oklahoma, so I'm offering a parent's glimpse into a city that my child will always consider home. That's not to say I arrived straight from the Dust Bowl itself. I've been here for six years now after also having lived in New York, Hamburg and Amherst, Mass. In time, I'll be able to share with C photos and stories of what it was like to live in those places. But those are memories, and their day-to-days have been lost. What I hope for with this blog is that I'll be able to show her exactly where she was, exactly what her mother and father were experiencing, on any given day. Maybe she'll find that boring. Heck, some days really are boring, and who can predict what a child will think? But, if she's anything like her mother, she'll be interested in visiting the past ... her past ... through pictures and words, hoping to put the pieces together in a puzzle that will never really be finished. So, as I said, I come to the table somewhat unprepared. I have no fascinating L.A. item or place about which I'm posting. But that will come. What I do have is a picture of my beautiful little girl looking out at the Pacific Ocean in Santa Monica, something I didn't see until I was 12. I also wanted to introduce myself and say that I'm just getting started.